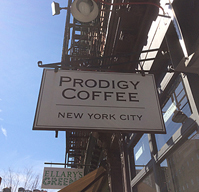 If you're looking for cup of Joe, Prodigy is worth a try. 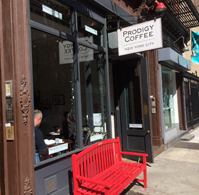 This friendly coffee shop with its hardwood floors, exposed brick and crystal chandeliers is flooded with light. Cafe-style seating offering an intimate break from the hustle and bustle outside. 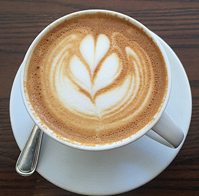 Coffee drinks - espresso, cappuccino, Americano and others - are served in porcelain mugs by trained baristas with a talent for creating intricate designs in the foam. A signature drink, called a "snake eye" gets a shot of espresso over melted chocolate. An assortment of cakes, including chocolate babka, are available along with croissants and other pastries. Packaged coffees are sold from far away places like Brazil, Honduras and Ethiopia.